Annual or biennial herb with a stout taproot 20 cm - 0.6 m tall Stem: upright, unbranched or branched above, hollow, sometimes hairy. Inflorescence: a terminal, congested cluster (cyme) of three to nine flowers subtended by (and often surpassed by) linear, hairy bracts. Flowers: stalkless, pink, dotted with white, toothed. Stamens ten. Styles two. Anthers purple. Sepals: five, forming a cylindrical tube (calyx). Calyx 1 - 2 cm long, five-lobed, 25-veined, densely soft-hairy. Petals: five, pink, dotted with white, 4 - 5 mm long, elliptic to reverse lance-shaped, clawed, toothed. Fruit: a dehiscent capsule (opening by four teeth), equaling the calyx tube. Seeds numerous, blackish brown, shield-shaped. Basal leaves: numerous and narrowly reverse lance-shaped. Stem leaves: opposite, upright, five to ten pairs, stalkless, 3 - 8 cm long, 2 - 8 mm wide, linear to lance-shaped with a pointed tip, hairy. Similar species: Dianthus deltoides and D. plumarius are similar but do not have densely hairy calyx tubes. Habitat and ecology: Introduced from Europe. Increasingly common in a variety of habitats, including near the woods by picnic and mowed areas of forest preserves. 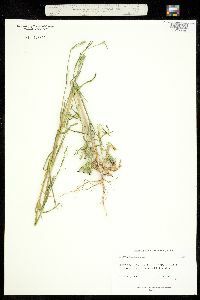 It is found in black soil but frequent in disturbed sandy soil as well, often in cemeteries and unshaded waste ground. It is also found along roads and railroads. Etymology: Dianthus comes from the Greek words dios, meaning divine, and anthos, meaning flower; the divine flower or the flower of Zeus. Armeria is Latin for Dianthus. Annual or biennial, 2-6 dm, the stem usually strigose below the nodes; basal lvs numerous, narrowly oblanceolate; cauline lvs 5-10 pairs, linear to lanceolate, 3-8 cm נ2-8 mm, pubescent; fls in congested, 3-9-fld cymes, often surpassed by the slender, erect bracts; cal villous-puberulent, 12-20 mm, (20-)25-nerved; pet-blade elliptic-oblanceolate, 4-5 mm, dentate, pink or rose, dotted with white; fr equaling the cal; 2n=30. Native of Europe, established as a weed from Que. and Ont. to B.C., s. to Fla. and Ark. May-July.